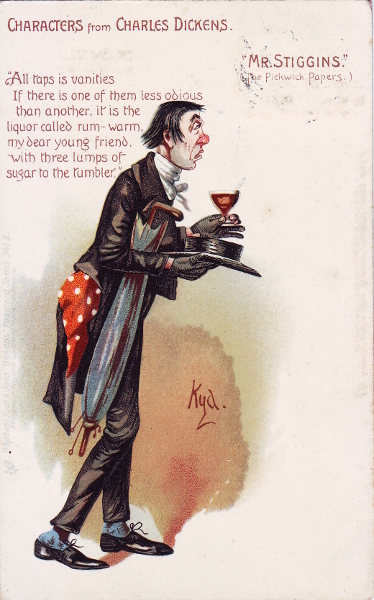 As regular readers of this blog will know, I live in Rome, Italy and therefore often feature vintage Italian postcards. Whilst I love my adopted city, there is one thing about the place that I hate – its crazy traffic and the sheer number of cars that are allowed to drive through the centre of a city that is one of the most historically important on the planet! Thankfully, there is one month a year when things get a little quieter and almost half of the population either take their cars elsewhere or leave them parked at home when they fly off on their annual vacation, which traditionally falls during August to coincide with the Public Holiday of Ferragosto on 15th August. The Roman Catholic Feast of the Assumption of the Blessed Virgin Mary is the occasion nowadays, although Romans have celebrated the day, albeit as a pagan festival, as far back as the days of the ancient Empire. 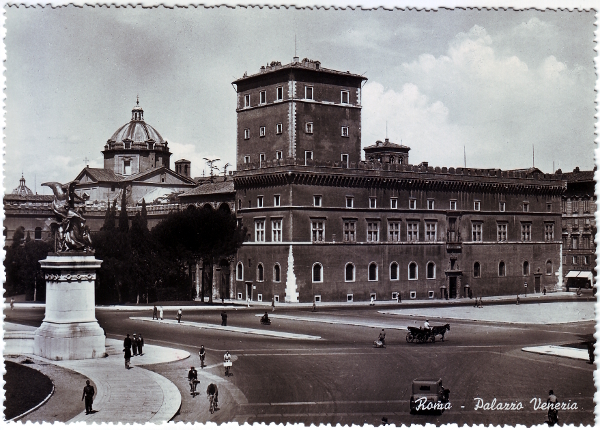 With Ferragosto in mind this 1953 postcard of Palazzo Venezia rather made me smile – this photograph was probably taken on a typical day, but Piazza Venezia looks impossibly quiet, with several cyclists, a horse and cart and one solitary motor car! Anybody who has attempted to cross the square from the Victor Emmanuel II monument (off camera, but found to the left of this shot) to the other side and Palazzo Venezia, knows how perilous this can be, with drivers gleefully ignoring even zebra crossings! 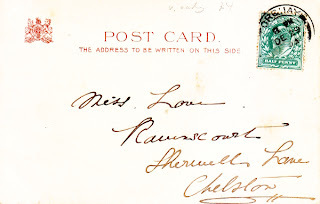 I also love this postcard because it features one of my favourite buildings. Palazzo Venezia (originally called Palazzo San Marco) is a perfect combination of Renaissance architectural elegance thanks to Leon Battista Alberti's 15th century designs, mixed with medieval fortification, built as it is around a medieval tower and incorporating the 4th century Church of San Marco. The very stuff of the building is even older however - much of the stone was plundered from the nearby Colosseum! 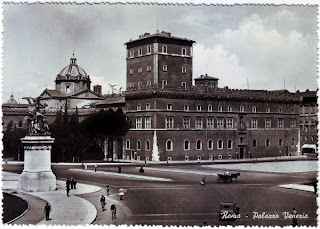 Used for most of its history as a papal residence, with part of the building also used as the embassy for the Republic of Venice (hence the name), at the time this postcard was issued the people of Rome would no doubt still have had the dark decades of Mussolini in mind – he kept an office in the Sala del Mappamondo and used a balcony in the palazzo for delivering some of his most famous speeches during the 1930s to the crowds below in Piazza Venezia. This postcard is one of series published by Enrico Verdesi, a local Rome-based company, issued as a souvenir of the first Congress of the International Federation of Engineers which took place in the city from 8 – 11 October 1953 (the event name is written in French on the reverse of the card - Congrès de la Fédération Internationale d'Ingénieurs). I featured another card a few weeks ago in my Rome Termini Station post. This is also a stunning glossy black and white real photograph postcard with pristine scalloped edges – I only wish I had the entire set! Happy holidays wherever in the world you are and Buon Ferragosto! Watch the video below to get an idea of how busy Piazza Venezia is today (or click here to watch on YouTube).